Hi everyone. Just wanted to let everyone know that this months "Challenge Kit" is available. 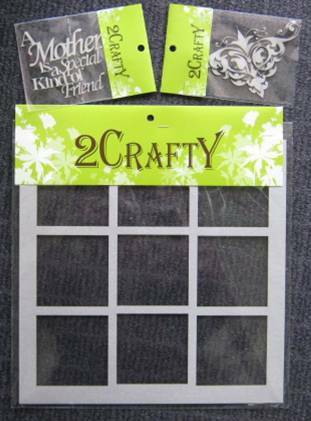 This month we have gone for something different & decided to use these gorgeous "Page Frames" from 2 Crafty for our monthly challenge & base it around Mother Day. If you look at the picture below you will see how one of the Green Tara Design Team girls, the very talented Vicky Alberto, has used a similar one. Vicky used one of these early last month on the Green Tara blog. Click HERE to see details.. 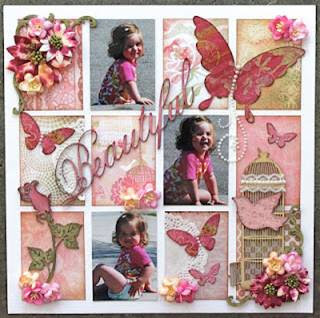 The one we are using in this months challenge is a 3 x 3 where as Vicky has used a 4 x 3. I can see this standing on an easel instead of just in an album, this way you can make it really 3D with flowers spilling over etc. Cost is $22.40 less discount & you have until 28th May to have it in for voting. The winner recieves a $25 prize. You use these three pieces & the rest is up to you. You can use whatever else you like with it. We thought with Mother Day nearly here we would have Mothers as our theme. Perhaps you & your children or you & your Mother or perhaps all three generations of Mothers & children. The choice is yours. Be quick to get your kit, I only got them in yesterday & they are going really fast, everyone that sees it really likes the whole concept.